SucculentID Mobile App just got juicier. We added the "Plant ID & Report" service. Supplies personal reports from your pictures. Send us an image of your plant and we can identify it for you. 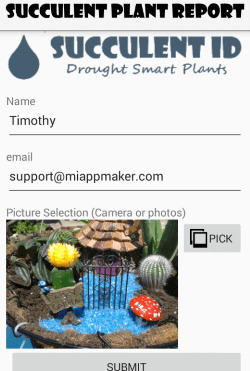 This mobile app tries to identify the most common succulent plants world wide. However, with 10,000s of species that is impossible. So, we let you ask for a personal report. Where we identify the plant for you and you get our report. But Wait, we can ID any picture of a succulent plant, Our "Certified Horticulturist " is an identification expert with over 20 years eperience. Our mobile app connects you with an expert. Your report includes care and instructions for feeding and watering of your plant. Here's how it works: Snap a picture or select from your image library...fill in your name and email address...click submit. We receive the request, identify the plant and send you a report. The Plant report tells you about your plant and how to care for it. You learn about sun, soil, watering, pruning and propagation. We tell you how big and how old your plant can get. Have you thought about getting 2 apps that are alike but work for both Android and Apple devices? Android and iOS apps are not the same. Different programming is required for each platform. This forces you to develop very similar 2 apps, one for each platform. 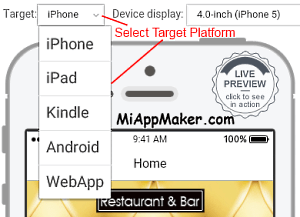 Miappmaker's plans have included a (1) and a (3) app package in the past. Recently we added a 2 app package. We call this package the "Enterprise' plan. Statistics show that the most popular mobile devices are Google Android and Apple iOS. Between these 2 platforms an app(s) covers over 90% of the world. If you want an app that reaches around the world to the users you actually need 2 of them, one for each platform. Miappmaker's new "Enterprise" plan does the job. Here is a scenario: You want an app that works on all the most popular devices, i.e. smartphone, tablet, iPhone and iPad then you need a 2 app package. 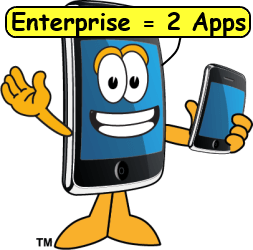 Get "Enterprise" one app for iOS and one for Android. Google Android automatically works on both smartphones and tablets. While iOS (Apple) can create apps for either iPhone or iPad separately. Except an iPhone app (iOS) can also be made into a 'universal' app. Meaning a 'universal' app can work on both iPhone and iPad. Are you a webmaster? Did you make a great website page? You're hoping for big results but it isn't happening. The problem is your page is too long and/or boring. Visitors lose interest quickly because it's hard to read. 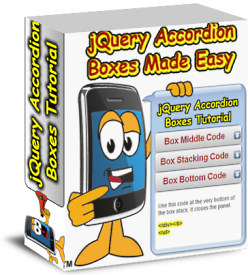 Accordion Boxes solve this problem. With a little code you can make your pages more interesting, organize your content better and please your visitors. Make users curious, give them a sense of control and fun. Check it out. 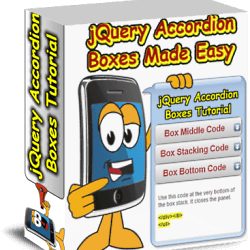 Accordion boxes can be used in many ways. Like this link you can use the software on any type of element, i.e. text, images, buttons, etc. 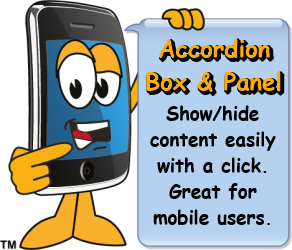 Accordion boxes are virtual panels that expand and collapse to show/hide content. Great for content management. Get creative with the presentation of your content. Need an app for that? 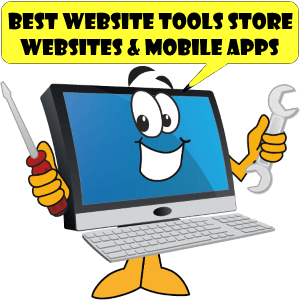 Find it in the new "Mobile App"s section of the "Website Tools Store." Building an online store is an ongoing process. We at BWT have tried to include all our products in an easy to use one stop online store. Recently we added a mobile app section. We have apps to do all kinds of things. We have mobile apps from utility tools to calculators to novelty apps. Drive Time Calculator for example is a do not leave home without it road trip tool. Triangle Calculator is excellent for students, engineers, designers and skilled trades. All our apps are well thought out and over deliver. Other upgrades include a mobile app and website building service added to the "Services" section. We also added hardware and software for computers.  Need something for your computer system. We added desktop computers, hard drives, disc drives, uninterruptable power supplies and computer repair software. 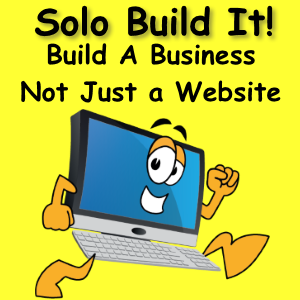 Got an idea for a website business? Got 2? Try SBI BOGO 2 for 1 holiday special. Having all the right tools for the right price is your best gift ever. Getting it right from the start makes the difference between success and failure. Here's how to turn your idea into a money making website. Once a year special offer from Solo Build It. Get 2 for the price of one website builder subscriptions. This could be the best decision you ever made. When you love what you do and are your own boss with an opportunity to create financial freedom you have to check it out. All the tools, support and instructions to be successful are included. By far the most complete collection of guides, community and step by step instructions available world wide. SBI is the only proven system to deliver exceptional results when it comes to online buisness building. Work from home and spend more time with your loved ones. Do something you love where you are the boss. Why SBI and not Wix, GoDaddy, WordPress or anybody else? Because of the support. SBI has the most informative Action Guide for building an online business. Couple that with the 24/7 support and community forums, you can ask and get answered any question about building your own online website business. The support group is made up of seasoned professionals and experienced volunteers with exceptional response time. SBI has all the tools! No need to go anywhere else to get everything you need, unless you want to. You can design your layout, build your webpages, build forms, start a newletter, create image galleries, and so much more. To many featues to list here so we made this collage. Limited time offer on now. 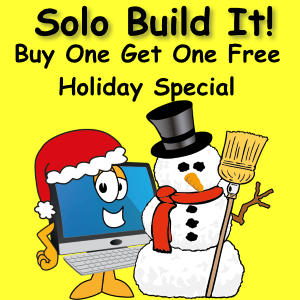 Buy one Solo Build It subscription and get one free. Only $299/yr is really unbeatable. You can pay that back in a short time. SBI shows you exactly how to build a website that makes money. Prefer WordPress? Get SBI for WP only $149/yr. You get everything in SBI plus WP plugins. Get everything WP offers and super size it with SBI. SBI for WP BOGO now till Jan 3. SBI is an excellent Christmas gift for your self and a loved one. Think about it you are getting a possiblilty for financial freedom. The opportunity to create a work from home job. Ideal for stay at home moms, retirees, young entrepreneurs and you. I am an SBI affiliate. If you purchase a subscription from this link I earn a small commission. Then I promise I will do anything I can to help you get started. Happy holidays everyone. May your wishes and dreams come true on Christmas morning. Did you remember everyone this year? No! Send an Amazon Gift card or electronic Christmas card with the "Christmas Cards" mobile app. Includes 8 beautifully designed cards. Select one, fill in a message then select an email address. Read the included "User Manual." Simple instructions guide you through your first card creation. Each time you make a greeting card a copy of it is listed on the countdown page. It shows a small icon of the cards and the date you sent it. Tapping on the icon will show the greeting card with the message on it. Allowing you see who is on your list of greeting cards sent. 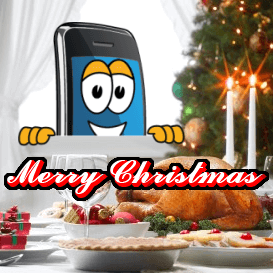 Share the holiday cheer with an email or bluetooth or text message or Gmail (if you have it). Want to send someone special something special send an Amazon gift card. Let friends and family pick their own gift.